Welcome to the series of events of Visual Arts, Show of New Music and Films of Architecture History. To start the activities of the year, in the afternoon of 27 March 2016, Heritage Space will hold a series of events of Visual Arts, Architecture and Music. 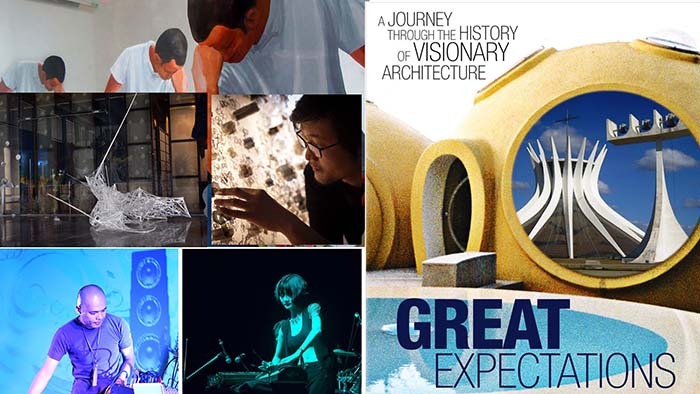 For architecture, there shall be the film “Great Expectation” (director: Jesper Wachtmeister) provided by the Club of Architecture Cinema and implemented by Ashui.com. For Visual Arts, there shall be an exhibition of painting, installation, multimedia and concept works and entitled “Heritage Space +”. It presents the selected products of artists who have been cooperating with Heritage Space over the last time. For music, there is a show of New Music by Vu Nhat Tan, composer, and his collaborators. The product is Cõi Vắng (Empty World) that shall last about 50 minutes. The mentioned activities are twofold important. The first is that Heritage Space introduces new projects and targets to support the contemporary arts development and to become a center for the performance, shows, education, exchanges in plastic arts, music and architecture. In the second, that is an occasion to present our new Management Board that is missioned to realize the targets of Heritage Space. 1. Trương Thu Hương – T’rưng and traditional membranephones. 2. Nguyễn Thuỳ Chi – Đàn bầu (monochord) and traditional songs. 3. Nguyễn Thị Thanh Huyền – Đàn Tranh (a plucked zither of Vietnam) and body movement. 4. Vũ Nhật Tân – Electronic musical instruments and piano. It tells about the pleasure and the pains of three women in the life, when they make access to the Buddhism just like he children do with parents to have peace in mind, getting rid of the disorders. The 50-minute performance is both an interaction and series of improvisations between traditional musical instruments (monochord, plucked zither, membranephones and the Ả Đào – tally card song) on the background of modern instruments (electronic instruments, laptop and piano). Musically, the work is composed based on the improvisations that feature the Vietnamese music and the chant poems accompanied by the piano sounds. Cõi Vắng (Empty World) may be regarded as a product of the interaction between the traditional music and the contemporary one, or the New Tradition; also a kind of improvisation-based performance. The film, directed by Jesper Wachtmeister, gives us a voyage to the detached housed, resident buildings and the towns designed by architects Le Corbusier, Oscar Niemeyer, Buckminster Fuller, Antti Lovage, Moshe Safdie, Jacque Fresco… and the architecture firms such as Archigram, Superstudio. These are typical examples for the products of which the architect is the “conductor of an orchestra” who has the full power of decision. Another issue is placed by the film: Has the architectural identity to be based on the traditional elements ? and should we look for an architectural “shape” to match such identity ? Please come to watch the film and discuss with the Club of Architecture Cinema. * Subtitle is available in Vietnamese. The irreversible trend of our era is characterized by the universal multicultural contexts where systems of values are getting in move, impacts, interference in large intensities. Paintings, music, movies, literature, sciences and technology etc. have been regarded as means to embody the human beings in historical and social contexts. But the boundary between these arts seems more and more imprecise. The utmost creativity together with capability of spatial, temporal and mind management has been opening multidirectional doors to the new horizons of cognition. The creativity has permanently dialoguing and challenging the cognitive ability of the beneficiaries of arts, also their enjoyment, then bring them new abilities and needs. In this new cycle of development, Heritage Space appears as a niche of multi-sector individuals and groups with an expectation to the link between the various and new elements of creativity in the contemporary Vietnam. There are activities of contemporary arts under the form of exhibitions, workshops, projects, lectures and presentations etc. involving national and foreign artists and curators and taken place regularly, aiming at popularizing the new values. There is a New Music Space, administered by Vu Nhat Tan, musician and organiser, where the selected and varied programs of music shows take place monthly. There are Architecture Activities with the cooperation and management of ASHUI.COM.